A few (gulp… has it really been that long?) months ago, I snapped up some blood oranges at Whole Foods with all sorts of ideas for what to make with them. We hardly ever see them down in Salem, so my mind was spinning with possibilities, such that—as is my wont—I couldn’t decide what to make and left them sitting in the veg bin of the fridge, rolling around forlornly whenever I poked my head in to grab an onion or some carrots. I finally determined to get it over with and use them up in a blood orange sorbet before they went bad, so this weekend I pulled them out, none the worse for wear, along with a big lonely Navel orange. After zesting one of the blood oranges, I peeled everything and chucked all the segments in the food processor, deciding that my life is just too short to try and wring every last drop of juice out of them by hand (a reamer is something I have yet to purchase). They were zapped into juice and strained to catch out the last bits of pulp and pith. I ended up with barely over a cup of violently red juice from 4 small Moro blood oranges and a big Navel. Meanwhile, I combined about 1/2 C water with 1/3 C sugar and brought it to a boil to dissolve the sugar. When it had cooled, I added the orange zest and a teaspoon of vanilla paste, and stirred it into the juice. Next time I would probably add the zest to the boiling water in bigger strips rather than grating it on my microplane, and then straining it out again before adding it to the juice, because the finished sorbet had hard little bits of zest that interfered with its otherwise smooth texture for me. 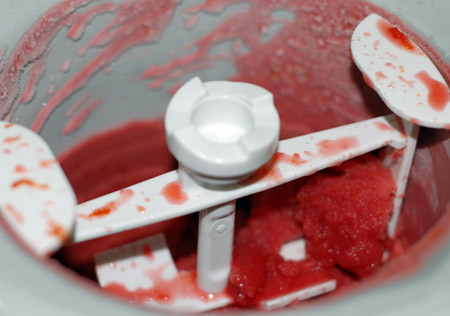 At any rate, the sorbet base went in the fridge overnight, and when we were ready for dessert on Memorial Day, I poured it into our ice cream maker and churned it up. It retained that lovely rosy color, as you can see, and struck a good balance between sweet and tart, with a little vanilla undertone. It was great right out of the machine, so we’ll see how the texture is from the freezer instead. And I should just note that although making sorbet is incredibly easy and quick with the ice cream maker, you don’t really need one to make it. 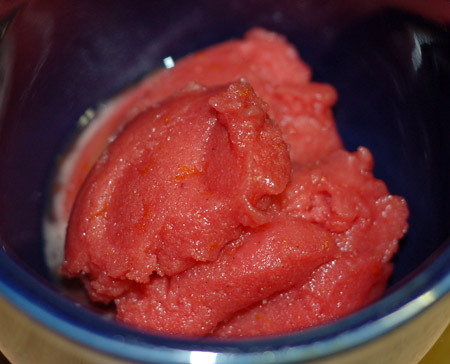 I made fabulous nectarine sorbet long before we had this machine, using pureed squishy/overripe nectarines and simple syrup, popped in the freezer and stirred up vigorously every hour until it had achieved the right consistency.